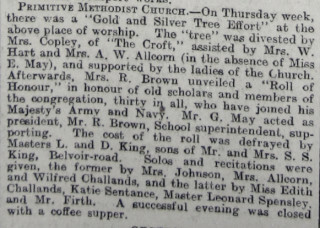 Grantham Journal, March 1915, article entitled "Chapel Gold and Silver Tree Effort" reporting the unveiling of the Roll of Honour at Bottesford Primitive Methodists Chapel, paid for by brothers Lionel and Daniel King. Lionel May King died in 1923, after completing his BA Hons degree at Christ College Oxford. He had served with the Gloucester Regiment, after enlisting in 1917 at the age of eighteen. “The death of Mr Lionel May King BA eldest son of Mr & Mrs SS King, occurred on Saturday evening last, aged 24. The deceased only took to his bend on August 3rd, and notwithstanding the best of medical skill and nursing, the end came on Saturday, to the great regret of a very wide circle. Mr King commenced his education at Bottesford National Schools. and then went to Sedgebrook Grammar School, and whilst here he matriculated in the London University in 1916. Although only 17 years of age, he joined the O.T.C. at Nottingham University College, where he stayed for about twelve months, when he went to Oxford to finish his final army training. After receiving his commission as 1st Lieutenant, he proceded to France, being attached to the 5th Gloucester Regiment until the close of hostilities. After being demobilised he proceded to Christ College, Oxford, to complete his education, where he graduated in chemistry and took his B.A. degree with honours. Deceased was of a very quiet disposition, and was greatly esteemed by all with whom he came into contact. He was a very enthusiastic lawn tennis player, and was a member of the Harby Club, the Riverside Club, Grantham, and captain of the local club. On the same day the Nottingham Evening Post also commemorated the funeral with a shorter version of this same obituary. 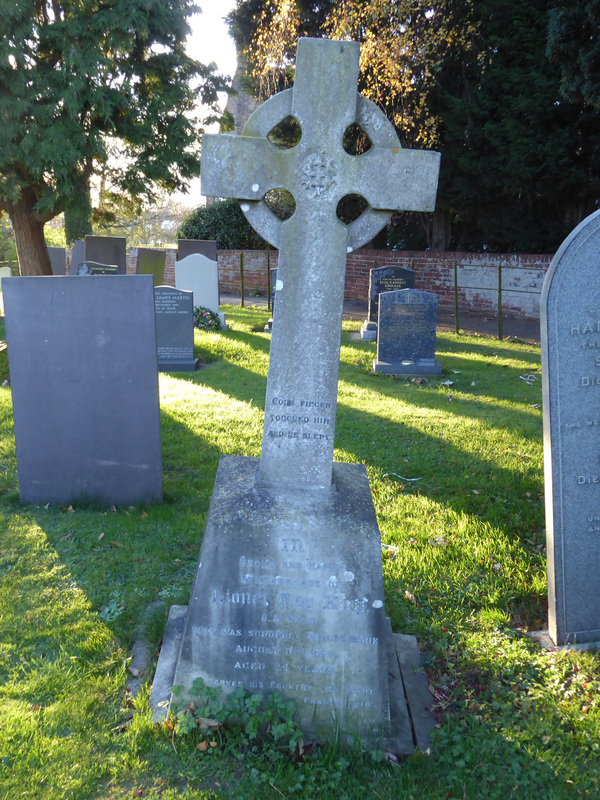 Lionel May King’s headstone can be seen in the northern section of the churchyard at St Mary’s, Bottesford, alongside that of this grand-parents Samuel and Hannah King. Samuel King was a Primitive Methodist preacher. He had a grocers shop on Chapel Street, Bottesford, as indicated on both the 1891 and 1901 census, and also in Kelly’s Directory for 1899. In 1891 there were three children, Samuel Sissons, born 1871, a “clerk in ironstone works”, Elizabeth, born 1866, a dressmaker, and Emily, born 1873, also a dressmaker. In 1901, Samuel Sissons King and his wife Caroline Ruth have moved to an address on Bottesford High Street, with their first child Lionel May King, born in 1899. Samuel gave his profession as “engineer’s shipping clerk”. By the 1911 census, the family had taken up residence in Linden House, Belvoir Road, Bottesford, and gave his profession as “engineer’s clerk”. There were now five children, Lionel being followed by Daniel George Leslie, Caroline May, Eleanor May and Rebecca May. Linden House was (and is) a detached brick-built villa, one of a group of ‘select’ residences built on the western side of Belvoir Road. 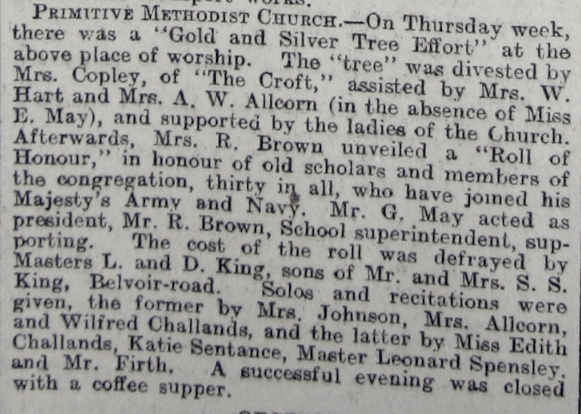 It was Lionel and his brother Daniel that met the cost of Primitive Methodist Chapel Roll of Honour, unveiled in March, 1915, by R. Brown, School Superintendent, “in honour of old scholars and and members of the congregation, thirty in all, who have joined His Majesty’s Army and Navy”. His obituary published by the Grantham Journal reported that Lionel May King progressed from Bottesford National School to Sedgebrook Grammar School, then in 1916, aged 17, joined the Officer Training Corps at Nottingham University College. 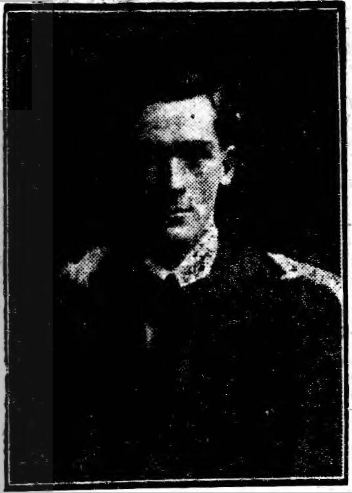 He moved to Oxford to complete his training and then enlisted and joined the Gloucesters in France, serving for ten months until the end of hostilities. We have as yet no further details of his service career or awards. He was demobilised and returned to Oxford, where he matriculated at Christ’s College in 1919, as recorded in the Oxford University Roll of Service (1920). He completed his degree course in chemistry and graduated with a BA Honours in 1922. His death must have been a great blow to his family and friends. We do not know the cause, whether the result of his wartime injuries or some other cause, and would welcome any further information that is shared with us. Died at home of natural causes.